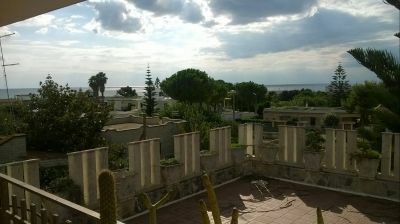 In Viale Lamastella on the coast road at Marina di Pulsano, near the beach Il Gabbiano, I sell an apartment on the first floor of a villa. The apartment has an independent entrance, it has an extension of about 100 square meters with a beautiful paved terrace of about 100 square meters overlooking the sea. The apartment consists of four bedrooms (large living room with fireplace + three bedrooms), two bathrooms, kitchen and utility room, plus a 15 sqm balcony with access from the kitchen. Climate control. For info and suggestions, do not hesitate to contact me.